• The Generals open a 5-game homestand tonight against Pensacola, with game 1 of the series…the Generals went 1-4 on the last road trip to Mobile…this is the 1st of 10 meetings this season with the Wahoos and their only visit to Jackson. • Faith Night: Tonight is Faith, with special guest former UT football player Inky Johnson. His speech begins at 6 p.m. in the Picnic Pavillion. • Starter Cam Hobson held the BayBears scoreless over 6.0 innings to lead Jackson to a 4-2 win over Mobile on Monday afternoon in Mobile. • Hobson (6.0,5,0,0,0,2) earned his 3rd win of the season, allowing only 5 hits and striking out 2 over 6.0 shutout innings. • LH Kyle Hunter (2.0,3,1,1,0,1,HR) allowed a solo home run 7th innings, while RH Stephen Kohlscheen (1.0,3,1,1,0,1,HR) earned his 2nd save of the season, despite allowing a solo home run in the bottom of the 9th inning. • 2B Patrick Brady (2×4) led the team with 2 hits, while SS Ketel Marte (1×4, R, BB), RF Jabari Blash (1×3, R, RBI), 1B Daniel Paolini (1×3, R, 2B, BB) and C John Hicks (1×3, RBI, BB) each recorded 1 of the team’s 6 hits. • After yesterday’s spot start by LH Jordan Shipers, the Generals have used 11 starters in the first 25 games of the season. Trevor Miller, Stephen Landazuri, Victor Sanchez, Jordan Pries, Cam Hobson, Taijuan Walker, Kyle Hunter, Moises Hernandez, Jochi Ogando, James Gillheeney, and Shipers. • Generals batters have struck out the fewest amount of times in the Southern League so far in 2014 (155, 6.5 SO/G). • OF Jamal Austin leads the league in total plate appearances per strikeout (1/14.86), with OF Leon Landry (1/12.33) ranking 2nd in the league. • The Generals made four roster moves prior to the opener against Pensacola on Wednesday. RHP David Colvin was placed on the DL, OF Nate Melendres was activated from the DL. OF Jabari Blash was promoted to AAA Tacoma. C Manny Pina was activated from AAA Tacoma. • RHP Mayckol Guaipe has not allowed an earned run over 15.0 innings to begin the season (8 G). He has limited opponents .196 (11×56) average, while walking 1 and striking out 15. • The Generals host the Pensacola Blue Wahoos for the only time this season, April 30-May 4 at The Ballpark at Jackson. • The lone trip to Pensacola for Jackson will be August 6-10 at Pensacola Bayfront Stadium. • The Generals were 6-4 last season against the Wahoos and since coming into the league in 2012 Jackson is 14-11 against the Cincinnati Reds’ Double-A affiliate. • The Wahoos roster features 4 of the Reds top 10 prospects according to Baseball America. No. 1 RHP Robert Stephenson, No. 5 OF Yorman Rodriguez (DL), No. 6 RHP Michael Lorensen, No. 7 Carlos Contreras and No. 13 RHP Daniel Corcino. 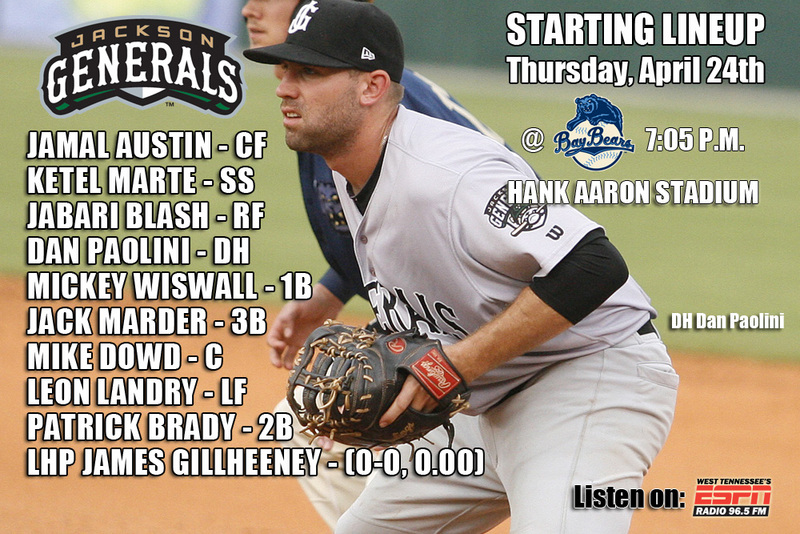 • The Generals try to avoid a 5-game sweep in game 5 of the series at Mobile (0-4). The last 5-game sweep was at Mobile, August 20-22 last season which included 2 doubleheaders. • This is the 3rd start before noon this season (1-1). • The Generals dropped their 4th straight game Sunday afternoon at Mobile, 8-1. • The BayBears scored 2 runs in the 1st, 3 runs in the 2nd and 3 runs in the 4th to coast to their 4th straight win. • Starter Stephen Landazuri was scratched during warmups with tightness in his left side/oblique. LH Jordan Shipers (0-2) went 3 innings and allowed 6 hits and 5 runs. RH Stephen Shackleford tossed 0.2 innings and allowed 3 runs and 2 walks. RH Richard Vargas and RH Mayckol Guaipe combined for 4.1 scoreless innings of relief. • After yesterday’s spot start by LH Jordan Shipers, the Generals have used 11 starters in the first 24 games of the season. Trevor Miller, Stephen Landazuri, Victor Sanchez, Jordan Pries, Cam Hobson, Taijuan Walker, Kyle Hunter, Moises Hernandez, Jochi Ogando, James Gillheeney, and Shipers. • OF Jamal Austin leads the league in total plate appearances per strikeout (1/16.67), with INF Jack Marder (1/14.0) ranking 2nd and OF Leon Landry (1/11.67) ranking 3rd in the league. • Generals OF Jabari Blash in has played in all 24 games this season and ranks T-1st in the league with 5 home runs, 3rd with 19 RBI, 6th in OBP (.431), T-2nd in extra base hits (11), 1st in runs scored (18), and 1st in walks (22). • OF Kevin Rivers has reached base safely in 10 straight gamesDuring the 9 games he is batting .273 (9×33), with 2 doubles, 1 triple, 5 RBI and 6 walks. • OF Jamal Austin is on a 7-game hitting streak batting .241 (7×29) with 4 runs, 2 doubles, 1 home run and 2 RBI. 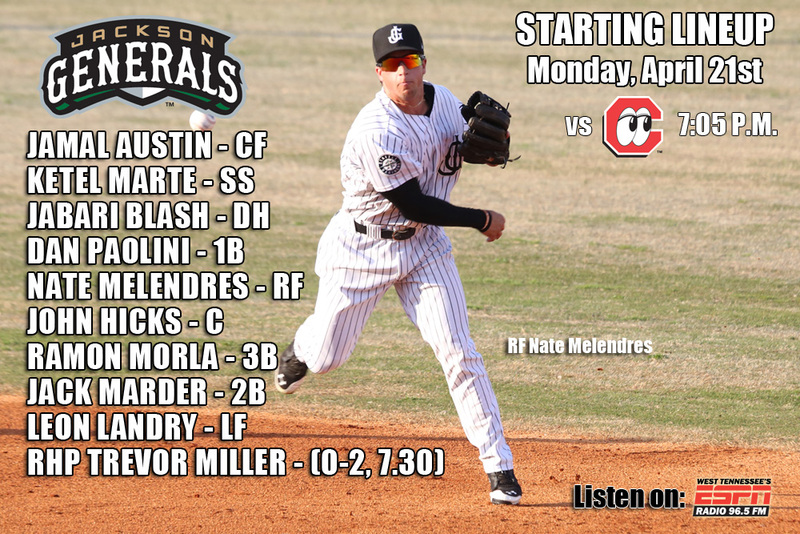 • The Generals look to stop a 3-game losing streak today with game 4 of the 5-game series at Mobile…the Generals are now 6-7 on the road and have lost 7 of their last 10 games. • RHP Stephen Landazuri makes his 5th start for Jackson looking for his 4th straight win and he ranks 2nd in the league with 30 strikeouts. 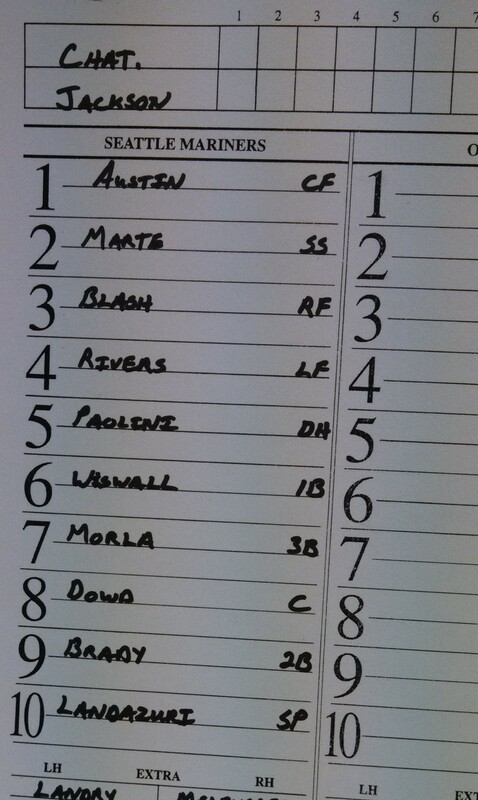 RHP Michael Lee starts for Mobile . • The Generals looked to bounce back from an 0-2 start in their series with the BayBears Saturday, however, the Generals fell 6-2 and hold an under.500 record for the first time this season. • Starter Trevor Miller (0-3) went 5 innings and allowed 3 runs on 2 hits, while recording 4 strikeouts. After exiting the game with a 3-2 deficit, Miller was saddled with his third loss of the season as the Jackson bullpen allowed three runs off of 2 home runs. • The Generals jumped out to a 1-0 first-inning lead following a solo home run by Jabari Blash (2-4, HR, RBI, R). Blash (5) currently is tied for the Southern League lead in home runs. • Jackson was out-scored 6-1 over the next 8 innings and lost its 3rd straight. • Generals batters have struck out the fewest amount of times in the Southern League so far in 2014 (153). • OF Jamal Austin leads the league in total plate appearances per strikeout (16.00), with INF Jack Marder (13.4) ranking 2nd and OF Leon Landry (11.2) ranking 3rd in the league. • Generals OF Jabari Blash in has played in all 23 games this season and ranks T-1st in the league with 5 home runs, 3rd with 18 RBI, 6th in OBP (.431), T-2nd in extra base hits (11), 1st in runs scored (18), and 1st in walks (22). • Over his last 6 games is hitting .462 (6×13) with 2 doubles…began the season hitting .133 (2×15) with 1 double in his first 6 games. • OF Kevin Rivers has reached base safely in 9 straight games and currently is on a 6-game hitting streak. During the 9 games he is batting .300 (9×30), with 2 doubles, 1 triple, 5 RBI and 5 walks. • OF Jamal Austin is on a 6-game hitting streak batting .240 (6×25) with 4 runs, 2 doubles, 1 home run and 2 RBI. • RHP Mayckol Guaipe has not allowed an earned run over 13.0 innings to begin the season (7 G). He has limited opponents .191 (9×47) average, while walking 0 and striking out 13. After allowing a run in his first appearance of the season. 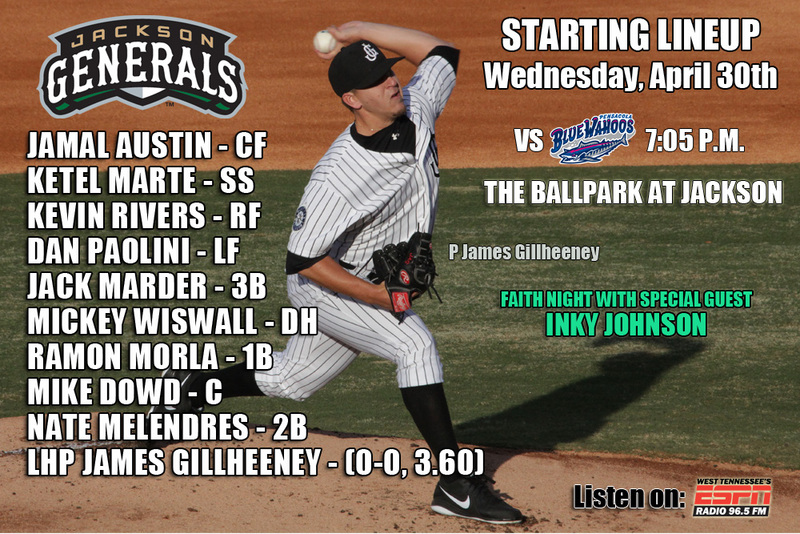 • The Generals look to stop a 2-game losing skid in game 3 of the 5-game series at Mobile (0-2). • RHP Trevor Miller makes his team-leading 5th start against Mobile LHP Andrew Chafin. • The Generals were limited to 7 hits as Jackson was shutout by Mobile 3-0 on Friday night. of the Generals 7 hits. (2.2,2,0,0,0,1) and RH Stephen Shackleford (2.0,1,0,0,0,1) combined to hold the BayBears scoreless over the final 4.2 innings in relief. • INF Dan Paolini has reached base safely in 11 straight games and is batting .286 (10×35) with 4 doubles, 1 home run, 4 runs, 7 walks, and a .405 on-base percentage. • Generals’ LHP James Gillheeney made his Double-A debut in 2010 as a member of the West Tenn Diamond Jaxx…Gillheeney is the only member of the current roster that has been a Diamond Jaxx and a General…He has made 37 career Jackson starts. • 2013 General Roenis Elias allowed only 2 runs on 6 hits in 5.2 Friday vs. Texas, but did not figure into the decision…walked 3 and struck out a career-high 6 batters (previous high: 5, 2x: last 4/19 at MIA). • Elias has allowed 2 earned runs or less in 4 of his first 5 career starts…is the 5th pitcher in franchise history to allow 2 earned runs or less in at least 4 of 5 career starts, joining Rich DeLucia (5, 1990), Bob Stoddard (4, 1981), Felix Hernandez (4, 2005) and Michael Pineda (4, 2011). • Elias has received 2 runs or less of support in 4 of his 5 starts, including 0 runs in 2 starts. • CF Jamal Austin homered for the first time in 183 games Thursday night in the 5th inning at Mobile…the solo shot was his first since July 1, 2012 while with A- Clinton at Burlington. • 1B Mickey Wiswall homered in the 6th inning on Thursday and it was his first long ball since September 2, 2012 with A+ High Desert.vs. 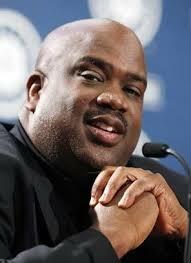 Lancaster…Wiswall missed all of the 2013 season with a hamstring injury. • INF Ketel Marte has hit safely in 16 of 20 games with an at-bat, batting .346 (28×78) with 13 runs scored, 6 doubles, 2 RBI, 9 walks and 3 stolen bases. • RH Stephen Kohlscheen has not allowed a run over 9.0 innings in relief (6 G), including only allowing 5 base hits over this stretch. Overall this season he is 1-0 with 1 save and a 0.87ERA (1 ER, 10.1 IP) in 7 relief appearances. He has limited opponents to a .189 average (7×37), while walking 1 and striking out 14. • The Generals and BayBears meet 20 times during the 2014 season, despite not being in the same division. • This is the first of 3 trips and 15 games in total to be played in Mobile at Hank Aaron Stadium. • Last season were 6-9 against Mobile which included a 7-game series in 4 days last August (2-5). 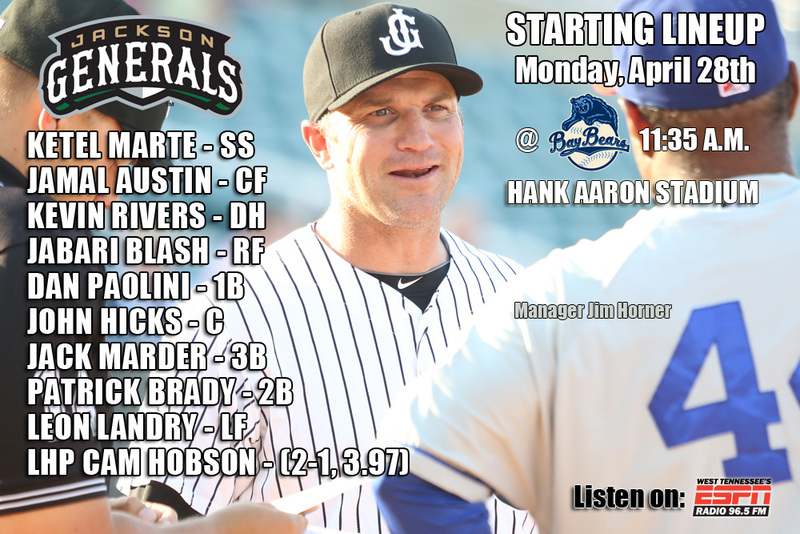 • The Generals continue their 5-game road series at Mobile today (0-1) with game 2 of the set. • Jackson is coming off a homestand in which they went 2-3 against Chattanooga. 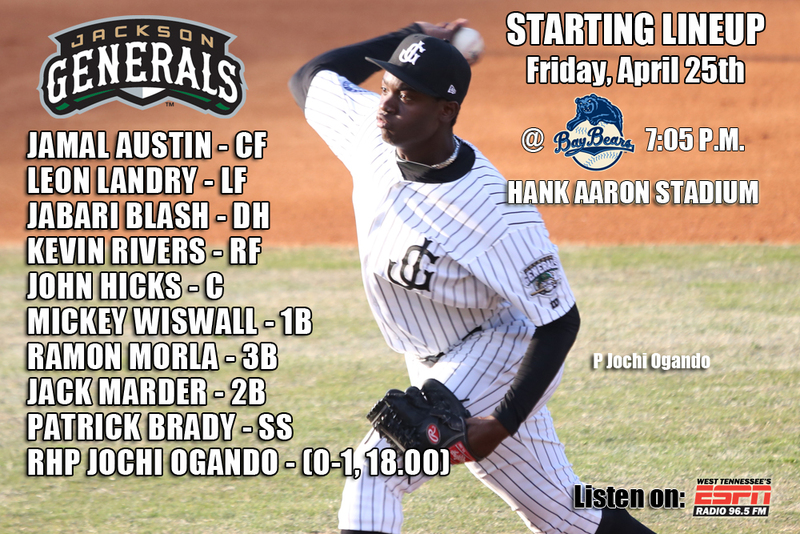 • RHP Jochi Ogando makes his 2nd Jackson start tonight against RHP Chase Anderson for Mobile. Anderson was 2-0, with a 2.57 ERA in 2 starts against Jackson in 2012…He spent last season with Triple-A Reno. 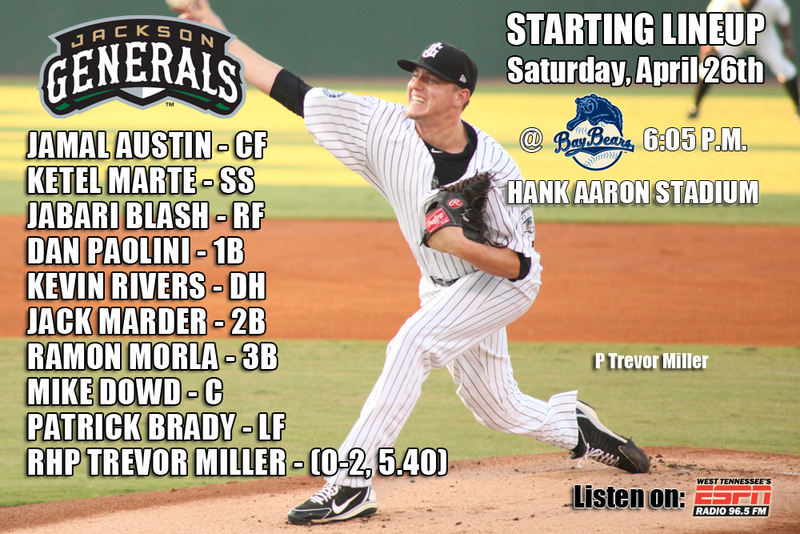 • The game can be heard on 96.5 ESPN in West Tennessee, jacksongeneralsbaseball.com and TuneIn Radio. • The Generals held a 3-2 lead heading into the bottom of the 6th inning, but allowed 1 run in the 6th and 5 runs in the 8th inning as Jackson lost to Mobile 8-3 on Thursday night. • 2B Patrick Brady (2×3, 2B, SB) led the team with 2 hits, while CF Jamal Austin (1×4, R, HR, RBI), RF Jabari Blash (1×4, 2B), DH Dan Paolini (1×2, R, 2 BB, SB), 1B Mickey Wiswall (1×4, R, HR, RBI), 3B Jack Marder (1×4), C Mike Dowd (1×4, RBI) and LF Leon Landry (1×4) each recorded 1 of the Generals 9 hits. • Starter James Gillheeney (5.0,8,3,2,0,2) allowed 3 runs (2 ER) on 8 hits in 5.0 innings, but did not figure into the decision. RH Moises Hernandez (2.1,6,5,5,1,3) recorded his 2nd loss of the season, allowing 5 runs in the 8th inning. RH Mayckol Guaipe (0.2,0,0,0,0,0) allowed 1 of the 3 inherited runners to score before recording the final 2 outs in the game. • Generals OF Jabari Blash in has played in all 21 games this season and ranks 3rd in the league with 17 RBI, 5th in OBP (.447), T-2nd in extra base hits (10), 1st in runs scored (17), and 1st in walks (22). 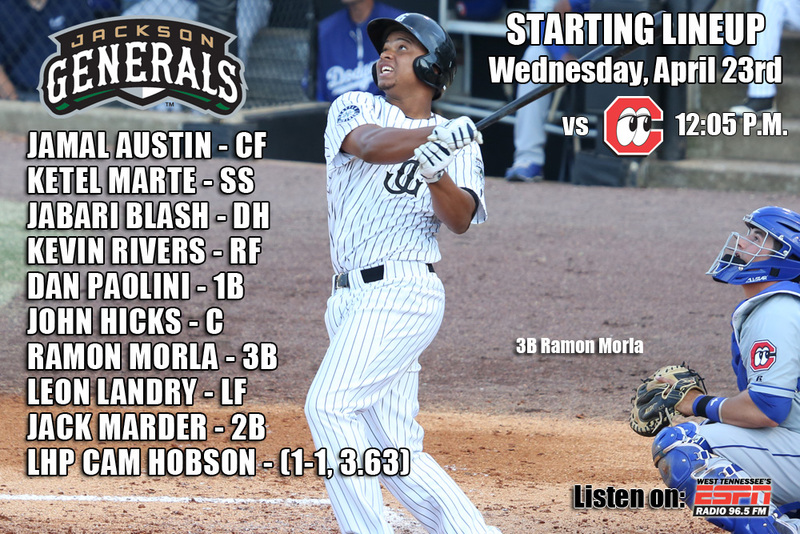 • The Generals open a 5-game road series tonight at Mobile. • Recently completed a homestand and lost first series of 2014 going 2-3 against Chattanooga…went 6-4 in the first two road series’ of 2014 to Chattanooga and Tennessee. • The Generals (wrapped up their series with the Chattanooga Lookouts with a 5-3 win Wednesday. The Generals took the final 2 games of their homestand after dropping the first 3. Starter Cam Hobson (2-1) earned his 2nd victory (both against Chattanooga) after tossing 5.1 innings. Despite allowing 3 runs in the 6th, Jackson’s bullpen held his early advantage. • Jordan Shipers (H, 1) went 2.2 innings and allowed just 1 hit. Richard Vargas (1) earned his first save of the season after retiring the game’s final 3 batters in the 9th. • The Generals have scored 11 of 15 runs in the last 3 games in the first two innings (2-1). • INF Ketel Marte has a hit in 16 of 19 games this season batting ..364 with 6 doubles, 2 RBI, 13 runs and a .430 OBP. He ranks 2nd in the league in AVG and 1st in hits (28). • INF Dan Paolini hit his 1st Double-A HR on Wednesday (44th game) and has a .294 AVG with 1 home run, 1 double, 4 RBI and a .898 OPS over his last 5 games. • Generals OF Jabari Blash in has played in all 20 games this season and has .262 AVG with 5 doubles, 4 home runs, 17 RBI and 22 walks in 68 at-bats). • The Generals fell on Monday night into Tuesday morning 7-4 in 18 innings and 5 hours, 17 minutes. It tied for the 2nd-longest game in franchise history. The longest was a 20-inning game on August 12, 2006 at Jacksonville in which the Jaxx lost to the Suns, 5-2 in 5 hours, 22 minutes. • During the game there were 11 pitchers used with 515 pitches, 32 strikeouts (22 by Jackson), 126 official at-bats , 22 runners left stranded and no leadoff hitter reached from the 8th inning until the 17th inning. • The Generals have been involved in the longest game in the Southern League in 2 of the last 3 years. • The Generals close out their 2nd homestand of the season today with the final game of the 5-game series against the Lookouts (1-3). • LHP Cam Hobson takes the mound for Jackson in search of his 2nd victory. He earned the win against Chattanooga back on 4/5 at AT&T Field. RHP Garrett Gould starts for the Lookouts, his 2nd against Jackson (0-1, 3.38). • Just over 10 hours after the 18 inning marathon Monday night ended, the Generals snapped their 3-game losing skid with a 6-4 win over Chattanooga on Tuesday morning. • The Generals jumped out to a 5-0 lead with a 2-run first inning and a 3-run second. Kevin Rivers (2-4, RBI) had an RBI single to score Ketel Marte (1-3, R, BB). Dan Paolini (2-4, RBI) doubled on the next at-bat to score Jabari Blash (1-2, 3 RBI, 3 R, 2 BB). • Blash homered (4) in the 2nd, scoring Mike Dowd (0-3, BB, R) and Jamal Austin (1-4, R). • Kyle Hunter (H, 1) recorded the final 2-outs of the 5th before David Colvin (S, 2) went 3.1 innings to earn his 2nd save of the season. • INF Ketel Marte has hit safely in 15 of 17 games with an at-bat, batting .378 (28×74) which leads the SL, with 13 runs scored, 6 doubles, 2 RBI, 8 walks and 5 stolen bases. • OF Nate Melendres has hit safely in 8 of 12 games with an at-bat, batting .351 (13×42) with 7 runs scored, 3 doubles, 1 triple, 3 RBI and 3 walks. • Generals OF Jabari Blash in 48 games since being promoted to Jackson in late 2013 is batting .294, with 13 home runs, 8 doubles, 37 RBIs and posted a 1.018 OPS for the Generals. • This season Blash currently ranks T-3rd in extra-base hits (9), 1st in runs scored (16), 1st in walks (20) and 4th in on-base percentage (.442) in the Southern League. • The Generals meet the Lookouts 15 times during the 2014 season and Chattanooga leads the season series so far 5-4. • The Generals hold a 41-34 record against the Lookouts since 2011. • The Generals will try to avoid a 4th straight loss this morning at 11:05 a.m. in game 4 of the 5-game series with Chattanooga. (0-3). • RHP Stephen Landazuri makes his 4th start of the season today. He currently ranks 2nd in the SL with 21 strikeouts. • The Generals found themselves on the short end of a 7-4, 18-inning loss last night to the Chattanooga Lookouts. • The game was 5 hours and 18 minutes, the longest game since August 12, 2006, a 20 inning 5 hour, 22 minute game. Generals pitching recorded 22 strikeouts in the game. The loss is the third straight and Jackson drops their first series of 2014. • The Generals held a 4-1 lead entering the seventh inning, prior to a Chattanooga rally. • Starter Trevor Miller (0-2) recorded a season-high 7 strikeouts and retired 12 of the last 13 batters faced before exiting in the 7th. The right-hander allowed just three hits and a run on 80 pitches (58 strikes). • SS Ketel Marte (3-7, RBI, R, BB) doubled to score Jamal Austin (1-6, 2 R) in the 1st before scoring on a single by RF Nate Melendres (1-5, 2 RBI) several at-bats later. Melendres provided an RBI in the third on a sacrifice fly to score Austin with one-out. • Both teams were held scoreless for 10 innings before Daniel Mayora hit an RBI triple that scored Darnell Sweeney in the top of the 18th..Scott Schebler added a 2-run home run to cap off the Chattanooga 18th and victory. • INF Ketel Marte has hit safely in 14 of 16 games with an at-bat, batting .380 (27×71) with 12 runs scored, 6 doubles, 2 RBI, 7 walks and 3 stolen bases. • RHP Mayckol Guaipe has not allowed an earned run over 12.1 innings to begin the season (6 G). He has limited opponents to a .196 (9×46) average, while walking 0 and striking out 13.
while walking 1 and striking out 9. 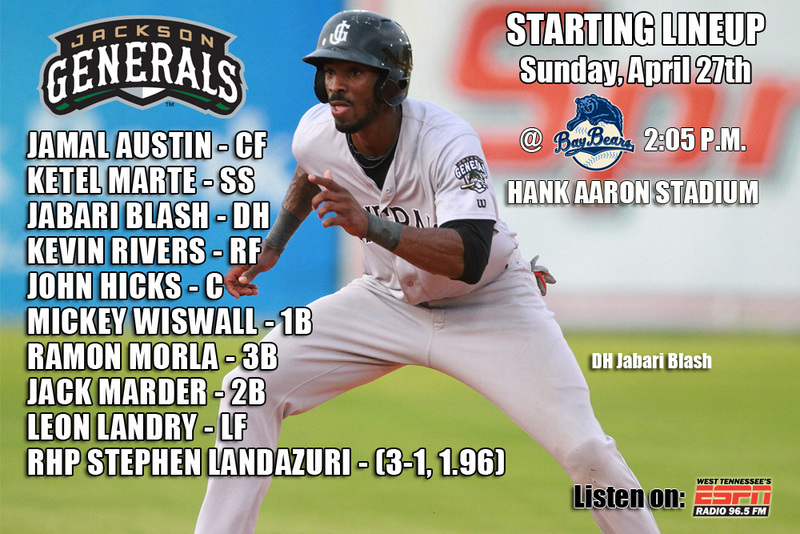 • Generals OF Jabari Blash in 47 games since being promoted to Jackson in late 2013 is batting .294, with 12 home runs, 8 doubles, 34 RBIs and posted a 1.020 OPS for the Generals. • This season Blash currently ranks T-2nd in extra-base hits (8), T-1st in runs scored (13), 1st in walks (15) and 5th in on-base percentage (.432) in the Southern League. • Memphis and Vanderbilt meet for the first time since 2008, a game the Commodores won 8-0 at then Pringles Park. • The series between the two teams is knotted at 11-11 dating back to 1981. • Memphis put together back-to-back wins for the first time since early March with a three-game sweep of Alcorn State over the weekend. • Vanderbilt enters midweek action with a 29-12 record, but are 4-6 in their last 10 outings. • The Generals meet the Lookouts 15 times during the 2014 season and Chattanooga leads the season series so far 5-3. • The Generals hold a 40-34 record against the Lookouts since 2011. • The Generals look to avoid a series loss for the first time this season tonight in game 3 of the 5-game set with Chattanooga at The Ballpark at Jackson. • RHP Trevor Miller makes his 4th start of the season tonight and 2nd at home. Miller is trying to stop a 2-game losing skid on the mound. Dodgers No.8 prospect according to Baseball America, LHP Chris Reed starts for Chattanooga tonight. The Generals scored 3 unearned runs against Reed on 4/5@CHA giving him a loss. • The Generals (9-8) suffered their worst home defeat since May 11, 2010 on Sunday night as the Lookouts took a 2-0 series edge after a 12-0 victory. • The Generals suffered back-to-back losses for the first time this season. • Starter Jochi Ogando struggled in his Double-A debut allowing 6 hits and 6 runs (5 earned) in 3+ innings pitched. • O’Koyea Dickson provided Chattanooga with 2 home runs and 6 RBI’s in Saturday’s victory. Dickson capped off the Lookouts’ 6-run fourth inning with a 3-run homer..
• The Generals recorded 2 extra-base hits in Saturday’s loss. RF Kevin Rivers (1×4) recorded a triple and C Mike Dowd (1×3) added a double. SS Ketel Marte (1×4) extended his hitting streak to 5 games. • INF Ketel Marte has hit safely in 13 of 15 games with an at-bat, batting .375 (24×64) with 11 runs scored, 5 doubles, 1 RBI, 6 walks and 2 stolen bases. • OF Nate Melendres has hit safely in 7 of 11 games with an at-bat, batting .351 (13×37) with 7 runs scored, 3 doubles, 1 triple, 2 RBI and 3 walks. • RHP Mayckol Guaipe has not allowed an earned run over 9.1 innings to begin the season (5 G). He has limited opponents to a .222 (8×36) average, while walking 0 and striking out 9. • Generals OF Jabari Blash in 46 games since being promoted to Jackson in late 2013 is batting .294, with 12 home runs, 8 doubles, 34 RBIs and posted a 1.020 OPS for the Generals. • Currently the Generals are 9-8 and are T-2nd place in the SL North standings, 2.0 games back of 1st place Huntsville. • The Generals offense ranks 4th in batting (.248), 1st in doubles (36), 4th in OBP (.332), 5th in total bases (184), and 4th in OPS (.693). • Generals pitching ranks 1st in WHIP (1.07), T-2nd in hits allowed (113), T-2nd in shutouts with 2, 5th in ERA (3.55). • The Generals meet the Lookouts 15 times during the 2014 season and Chattanooga leads the season series so far 4-3. • The Generals hold a 40-33 record against the Lookouts since 2011. Chris Gwynn, Mariners’ Director of Player Development is in town and I had a chance discuss everything Mariners Minor League’s including rehabs, injuries, who’s off to a hot start, what to expect later in the year, Choi suspension and much more. The four full-season Mariners Minor League teams are a combined 36-26 going into Sunday.